Ricoh has just announced another interesting camera with innovative features. The CX2 is a 10.7x (28-300mm equivalent) superzoom that's home to a 1/2.3-inch 9.3MP CMOS sensor. Using the CMOS chip allows Ricoh to offer high speed services like a 5fps burst mode at full resolution, rising to 120fps at VGA resolution. Advances include flavour-of-the-month feature high dynamic range, where the CX2 combines two images of the scene shot at different exposures to give a single ultra-realistic image. You choose four levels of effect (from 'very weak' to 'strong') or let the CX2 automatically choose the exposure settings, to expand the dynamic range by up to 12EV. Other unique offerings include multi-target AF, a mode where the camera shoots complex scenes at seven different focus points - letting you choose which to keep and which to discard. The CX2 can also shoot backwards in time, continuously shooting images at either 5fps at 9MP (or 30fps at 2MP), but only saving the preceding 45 (or 30) when you take your finger off the shutter - great for catching one-off events. More Japanese weirdness comes courtesy of 1:1 format shooting (to help you pretend you have a medium format camera), a built-in electronic level to avoid wonky horizons and, our favourite, Today's Shot - a function that displays how many pictures you have shot that day. Handy. Finally, miniaturisation mode blurs the top and bottom of the image to make it look as though everything you shoot is really, really small. It sounds strange but it works brilliantly on the right images. 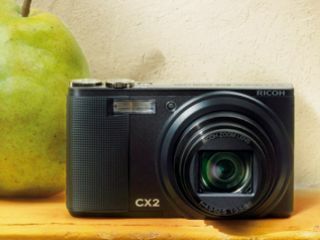 All this, plus an ultra-sharp 3-inch, 920,000-dot LCD display, 1cm macro mode and high-contrast black & white mode can be yours for just £300, when the Ricoh CX2 goes on sale shortly.